Something all bodybuilders, weight lifters, power lifters and other athletes share is a certain degree of dedication and devotion to there sport - whatever it may be. Only the levels of that dedication alter. Millions of people regularly visit there local pub to socialise and drink with there friends. Within this close atmosphere a unity is generally established between the patrons. The way this unity is expressed for one and other and of course the "local" is through team activities such as football, darts, pool, rugby, tug 'o' war the list goes on and definitely alters depending on where you live. As you will have all noticed at some point or another, there are certain characters that stand out in these local teams for either being completely over the top, like every game they are playing is for there own life, or your regular �Mr. Couldn't give a....... � but is always there for the team even if they can't be arsed. What you have there is two types of people who are both devoted and there for their team mates, but the level of dedication is different. What would also be noticeably different would be there own personal sense of achievement. Win or lose, Mr. OTT feels strongly about his own personal performance, �Mr. couldn't give a......� may be a bit pissed off with a loss or happy with a win but generally couldn't give a .....! Bodybuilders are very much alike. There are the devoted and truly dedicated and there are the devoted and not so dedicated. I personally have been both at sometime or another, I believe we all have, but getting through those low times is what separates the men from the boys, and if you haven't experienced it yet, you will! Absolute dedication and devotion is required in bodybuilding to make any significant quality gains. Dedicated to the gym, to your diet and devoted to yourself. If you don't share the same view, you may feel this is a very selfish attitude, and I would be in complete aggreance with you. However getting the balance between your life and your training is the key, bodybuilding has altered my life and the way I lead my life but not completely took over it. If this was to happen, bodybuilding wouldn't be a pleasure it would be a problem, one must keep an eye on this to make sure training doesn't become "TOO" obsessive. It happens. Find the balance, stand back and be amazed. Distractions play a big role in everybody's lives. We all get distracted at some time either from our training, work, household chores anything and everything, usually because at the time something seems better than what your already occupied with. I am nineteen years old, due to be twenty in August (the 26th actually.....just a hint) and as a bodybuilder I believe I have come a long way in a short time, but had to overcome a lot in that short space. Many of you, whether your an old or young bodybuilder will have had your dedication and devotion pulled and tugged at sometime or other, it may be happening right now. A word of advice, stay strong, stick with it, it'll pass, for Gods sake don't let whatever it is drag you away, because when you stand in front of that mirror and hit a side chest, POW! And people turn there heads. I don't think theres any better feeling of self satisfaction. 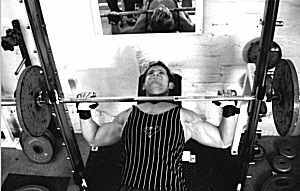 When I first started experimenting in the gym I was about sixteen years old. I have a training history behind me but this involved punch bags and contact mitts not barbells and benches. The reason I started training was purely for "pulling" reasons, to make myself more aesthetically appealing to the female eye (but don't we all) and I wanted it yesterday. So I trained my arse off with no set routine, just a general circuit, for about two weeks. When I had finally recovered and the soreness had gone away, I realised that I liked the feeling the gym gave me, at that point I could feel my devotion to the sport growing, and so could my Dad. He sat me down and gave me a few pointers, demonstrated good, clean, correct style exercises and put together a training system for me to gradually introduce me to the gym. Even though this was the beginning for me in my own training, the gym wasn't somewhere completely alien to me so I had a pretty good idea of what was for what. As you can see three days a week was all I was training, this was for various reasons. 1. I was new to the sport so introducing me steadily to the gym was important, for safety and to prepare the body for the onslaught ahead. 2. Three days a week was easy to adjust to, and didn't effect may life to dramatically which is very important to a young potential bodybuilder, as sudden change at a young age or any age for that matter can be hazardous in any pursuit, especially for a young whippersnapper like myself who used to get bored of his presents by Boxing day. Gradual is the key. 3. The routine was simple and easy to get along with, which is vitally important. If you are new to the sport and have been reading all the top pros training routines and are trying to follow them, heed this advice. Providing you have good style, technique, attitude and enough dedication and devotion you'll get along fine and make some fantastic gains. The pros have been at this game for a long time and have developed there style to such an extent that every inch of movement either on a machine or with free weights is utilised correctly and used to there advantage, you to will develop these skills, you already may have but until then try and keep it simple. My diet was never a real concern to me before I made the decision to compete, however I always realised the importance of eating good wholesome food and plenty of it. A good breakfast, dinner and tea and trying to avoid to much crappy snap and ale was about the extent I went to. This again was to try an avoid complications and keep away the monotony of a regular strict diet. Complicated may have been my down fall in the sport. Nobody wants to be counting calories, protein, carbs and fat especially at sixteen, I mean I don't do it now and have no intention to, as long as I get in five to six good balanced meals a day in I don't mind (some of those being meal replacement drinks of course PHEW!). I have always supplemented my diet, this being through my own personal understanding of the body. Everyone whether athlete or non athlete should take some type of supplements at the VERY least a multi vitamin, and for bodybuilders this should be imperative. Continually hammering the body with weight assisted exercises, the muscles and organs of the body are working under a certain level of stress. Because of this, extra nutrients are needed in the body to feed us and allow biological functions to take place, without the right nutrients we can not work at our optimum rate thus leaving us with allsorts of disorders, fatigue, acne, illness etc. etc. Enjoying your training is vitally important. The only way to succeed in your goals is to enjoy what you are doing. However, training may make you feel great, it may make you feel alive and young again (to those it may concern), but everyone needs a break, and without a break you may be holding back some quality gains. I personally like to take at least 3 good breaks a year, probably one every four months. A good week lay off to give the muscles, joints, ligaments, generally the whole body a well deserved rest. The stresses of work may "strain the brain" and for this a holiday is booked to get away, recover and help keep the monotony of the job at bay. Don't you think hammering the body continually with weighted exercises stresses the body some what, to such an extent that a holiday is warranted? I think so, and so far it has only helped in my training. Another good reason to take a short break is to keep ones dedication and devotion focused on the task ahead, and a chance to look and reflect on what is important in your training. Example, your routine, diet, symmetry etc etc. Symmetry for example can be and is a worry for many bodybuilders. The thought that the body is lacking in certain areas can really be disheartening and a hindrance in the gym. Use the time allocated to rest and recuperation to asses what is required from YOU, this way the next time you walk into the gym, you should have a clear and focused mind on the job ahead.